The U.S. has accused Russia of aiding Syria's attack on civilians by selling Damascus new helicopters. U.S. President Barack Obama and Russian President Vladimir Putin may discuss the issue during a bilateral meeting on the sidelines of the G20. The deliveries of Russian helicopters to Syria has evolved into an international mystery. The U.S. State Department keeps insisting that Moscow has shipped attack helicopters to Syria for use by Damascus against civilians; the Russian Foreign Ministry denies the allegations. Although U.S. Department of State didn’t give any clear evidence that Russia shipped to Syria its helicopters, it also refused to officially repudiate its statement. It may be one of the key issues during the negotiations between Russia’s President Vladimir Putin and his American counterpart Barack Obama at the upcoming G20 summit in Mexico. When asked repeatedly to confirm whether Clinton’s accusations mean that Russia was shipping new attack helicopters to Syria, White House spokesman Jay Carney did not give a direct answer. “I have no specific reports on this matter,”Carney told the media. A New York Times report clarified the situation somewhat. “Pentagon sources suggested that Mrs. Clinton was referring to a Russian-made attack helicopter that Syria already owns but has not yet deployed to crack down on opposition forces. While these helicopters, known as Mi-24s, are flown by Syrian pilots, Russia supplies spare parts and maintains them,” read an article published June 12. 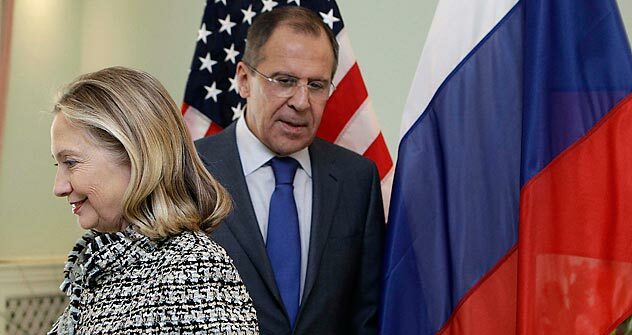 This “exchange of civilities” between the foreign offices of the two countries might as well continue; yet the verbal swordplay between Clinton and Lavrov implies something else. In 2010, the U.S. government awarded the Russian firm a contract to supply 21 Russian-made Mi-17 helicopters worth a total of $550 million for Afghanistan’s forces. Shortly after the tender, American helicopter builder Sikorsky Aircraft Corp. filed an official protest, accusing the military of failing to comply with the tender terms and the Buy American Act and sought to have the contract annulled. The protest was rejected at that time. Later on, 17 lawmakers requested that the secretary of defense to put an end to purchases of Russian helicopters. The recent attacks on Russian arms must be seen in this context. On June 12, Assistant Secretary of Defense for Public Affairs George Little defended the contract, saying that Afghanistan required reliable defense forces and that the contract should be treated separately from the concerns over possible arms deliveries to Syria. Time will tell whether there is a connection between Clinton’s remarks and those made by the lobbyists. In the meantime, Reuters reported on June 14 that the Pentagon had notified Congress of plans to purchase 12 more Mi-17V-5 helicopters from Rosoboronexport for the Afghan military, in addition to earlier supplies.